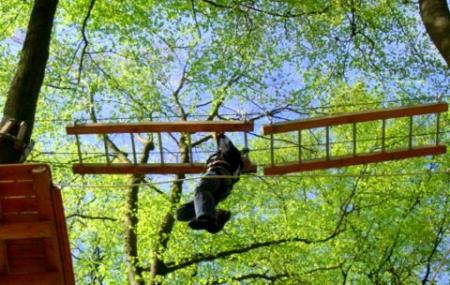 Find hotel near Kletterwald Luneburg-scha ..
A paradise for adventurers, Ketterwald lüneburg-scharnebeck gbr scharnebeck in Germany is a climbing forest. It is known for the unique jungle activities, adventures and tasks which can be enjoyed by people across all age groups. The most fun part about these activities is the use of traditional tools like maps and compasses instead of the GPS technology. This makes it a fun-bonding activity which is ideal for group tours as well as individuals who are looking for a dose of adventure. Other activities like paragliding, cycling, hiking and horseback riding are also popular among visitors here. Find the joy in planning a D.I.Y. trip by using this awesome Scharnebeck trip planner. You won't miss your home when in Scharnebeck, hotels in Scharnebeck like Vital Hotel Adendorf, Landhotel Franck, Comfort Hotel LÃÃƒÂ¼neburg and Hotel Bellevue offer some of the best places to stay in the city. Chalk out the best way to discover the city with Scharnebeck vacation packages. Check out various modes for how to reach Scharnebeck. Love this? Explore the entire list of places to visit in Scharnebeck before you plan your trip. Fancy a good night's sleep after a tiring day? Check out where to stay in Scharnebeck and book an accommodation of your choice. Mehrere Strecken, die einen normal-fitten Menschen an seine Grenzen bringt ohne zu überfordern. Besser als die Website vermuten lässt. Toller Kletterwald mit verschiedenen Schwierigkeiten, abwechslungsreiche Hindernise und sehr freundlichem und hilfsbereitem Personal. In der gegebenen Zeit ist es definitiv möglich jeden Parcours einmal zu bewältigen. Der Preis ist angemessen. Klare Empfehlung! Wer Spaß an sowas hat oder es mal ausprobieren möchte, ist hier genau richtig. Alles wird super erklärt, Ausrüstung top. Der kleine Kiosk bietet genug an um die notwendige Pause zu versüßen.